I have an unholy relationship with my ancestors. Part resentment, part hope. I do know their out there but well truly behind the veil of unknowing. The abyss of imagination. I like to think I was severed as protection from some great burden of pain. The line that I draw from slowly dispersed in a cloud of gas, or an ethnicity so rare that it had to be corralled into oblivion, the violins strings breaking as the fires raged progress forward. I often think I would prefer the story, the knowing, to be able to look back on that line I pull forward to the place it is anchored, drawing on the perspective given. Instead I'm a messy secret, the line simply disappears into mist, dark. Narnia enthralled me as a child, but the Magicians Nephew was by far my favourite. It was the place between the worlds. A recognition when I read the urgency of limbo. I have a clear image and even sharper focus of what it is like to move between, the line is broken and all you have is choices. Choices best not taken with thought. More of a movement, heartfelt. I would imagine the doors as trees for I felt that they were all portals and indeed when I felt into my rootless body I simply know I had to move deeper down. Grandmother Aspen and Madrona, Grandfather Cottenwood and Alder guiding me through as I revolved around the wheel. I had to feel through my roots as the story was shrouded. I had to really stretch to where we begun, the scream of blue, the drumming of the earth, the Iceni rhythm of living in sentience with our mother. My mother. The grasp of the sky and grip of rock, the gathering of seasons, the thrum of weaving, the sing of iron, the sizzle of flesh, the sweep of blood in the grove, the tang of fresh splatter in offering for more secrets. I felt the loss, the loss of my story and of us all, white hapless invaders, bereft of living indigenous, bereft of those who worked and walked with the land. And it is to this loss that I offer this Samhain, it is to this loss that I build my hallowed alter, the cut and unceasing expression of the wound. 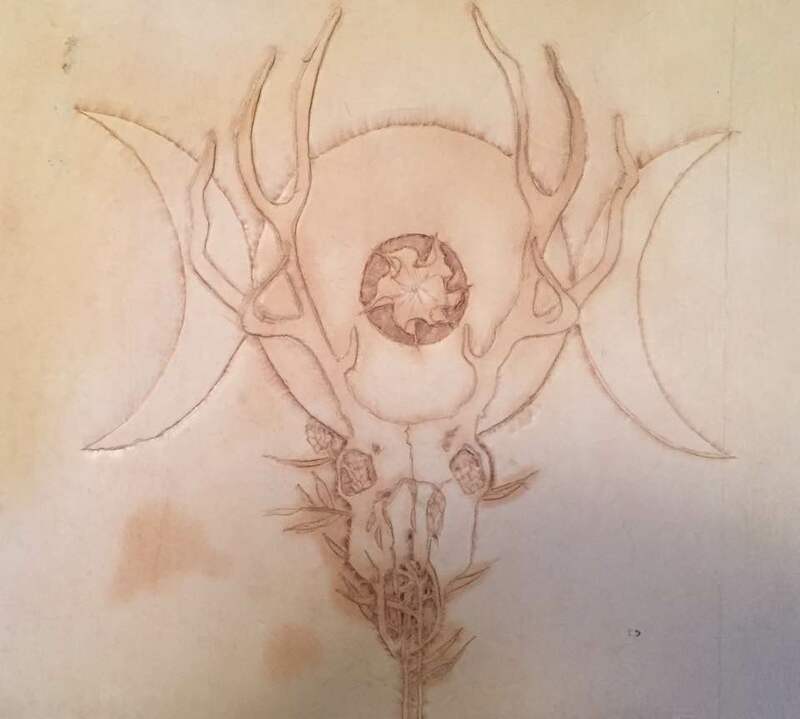 It is in response, response to my wound, our wounds on this day of the ancestors that I drew this journal with rabbit tobacco and datura. My nod to our kin and the earth knowledge that they took with them. Im a cinderbiter chocking on ashes. The whole summer has been one of pheonix flashes, spirit resurrecting after crawling and slithering through gunky fecundity. It has been the slow steady march of heartbeat and breath that move me forward as there have been no signposts, portents, illuminating resolutions, just the gnarled web of sweaty restless dreams and underground ministrations. Ever connected but ever distanced from the earth I felt so acutely human as I huddled by the hearth and watched her burn, the ashes stuffed into my hollow words and endless need. When will we stop devouring? As part of this tribe the shame and disgust of the jagged rush into consumption in the name of progress had me down on my knees and all around the devouring continued until we swallowed the sun. Distractions were stripped away as the eclipse mirrored our souls. There was only endless reflection. I became still with the darkness of the sky, still while witnessing the blood red moon and absence of clear shadows, still as the light became opaque, distant, untouchable and the forest's burned around me, the earth swallowed in gulps, the tempest whistling. I became still so I could look into the forest, feel my allies and friends, catch songs from the ancient one's. I felt the distinct lack of fear, I felt the shift of Gaia's shoulders shaking. The hum of never care, the present of being all and everything. I tasted the green luminescence, the flow of source thrumming, belonging through the earth and all of us. Whether it be black oil veining the creaking beating of the earth or invisible particles floating of into the atmosphere the tress knew me no mind. The forest knew endlessness. Look to your own kind were the words that carried up from my heart. Manage yourself now. 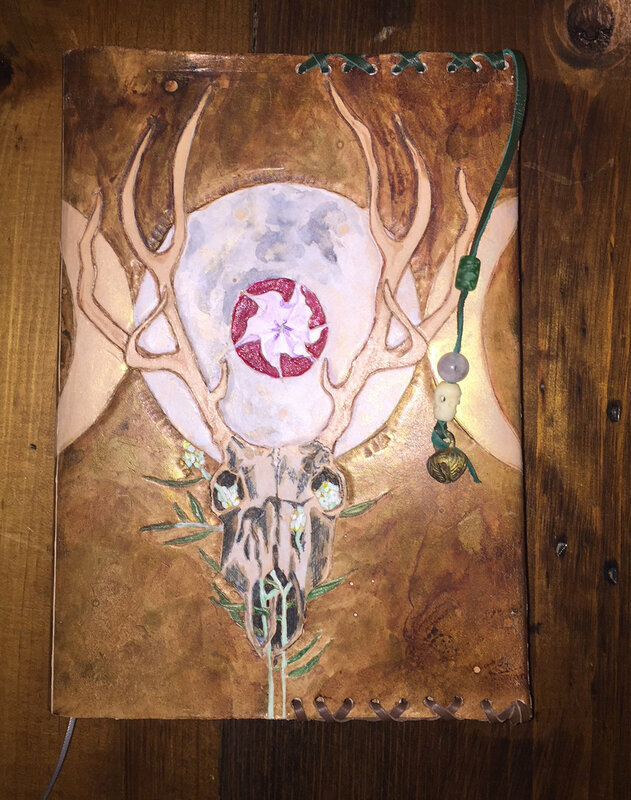 I drew these two journals to honor the forest and its knowing. To remember that it is part of my greater whole. An admirable acquaintance, Cassandra of House of Hands called out for submissions for her latest edition of Numen Naturae, part of a series based on plant spirit archetypical knowing. It was titled Black Cohosh, Priestess, The womb of the earth. Commensurately I had been working with Black Cohosh for the past year having scored some lovely fresh root that was offered up on one of my herb lists for the price of shipping. I always struggle to connect with plants I haven't met and Black Cohosh being primarily east coast medicine had as yet evaded me so I jumped on the offer and soon was the proud processor of 2 lbs of fresh root. I made the medicine, held the meditations and proceeded to acknowledge and make delicate advances with this shy, mirrored and powerful being. Its always interesting to enter into relationship with the visible invisible and I quickly became quite in awe of the silent power to hold, carry and regulate. The phrase "womb of the earth" I found exquisitely appropriate with my Black Cohosh due diligence. The phrase galvanized a percolating image that had been asking for birth and I started to reach for the tracing paper, quickly sketching out what was in my minds eye. The result is a Black Cohosh journal cover embossed on vegetable tanned leather, kangaroo lacing (lavender no less) in a new edging stitch and currently sized to fit moleskin journals.